The Stream debugger is a hidden gem for working with Java Streams. 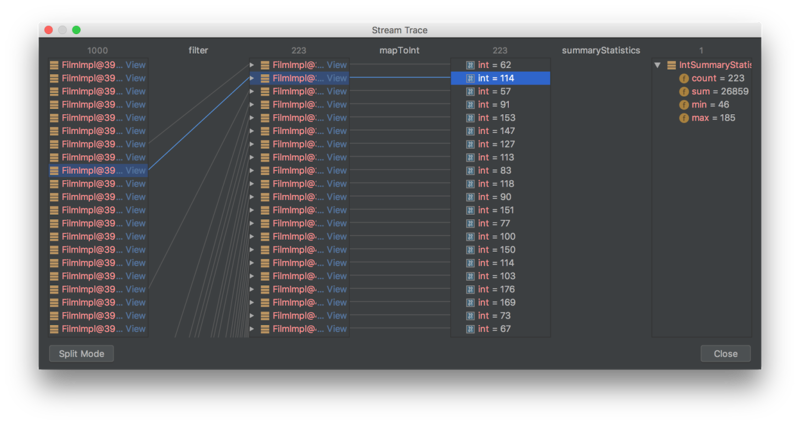 Check out this tutorial to learn how to debug Java streams with IntelliJ. Streams are very powerful and can capture the gist of your intended functionality in just a few lines. But, just as smooth as they are when it all works, it can be just as agonizing when they don’t behave as expected. 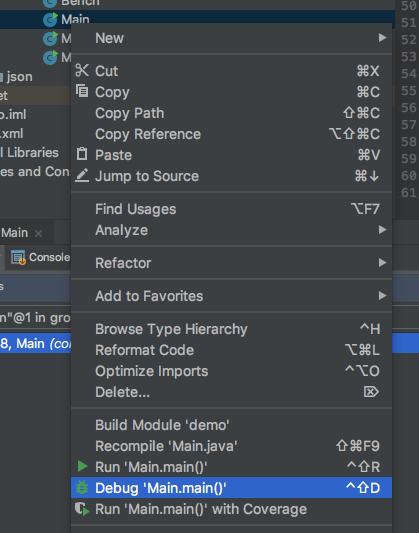 In this tutorial, we will learn how to use IntelliJ to debug your Java Streams and gain insight into the intermediate operations of a Stream. In this article, I will use the Sakila sample database and Speedment Stream ORM in my examples. The code above first creates an initial Stream consisting of the String elements, "C""A", "B ." Then, an intermediary operation sorted() is applied to the first Stream, thereby (at least in Java 8-10) creating a new Stream where the elements in the initial stream are sorted according to their natural order. I.e. the second stream will contain the elements "A", "B", "C ." Lastly, these elements are collected into a List. Stream<String> s0 = Stream.of("C", "B", "A"); // "C", "A", "B"
Stream<String> s1 = s0.sorted();              // "A", "B", "C"
This is not exactly how it works, technically, but it provides a good overall outline. This gives a clear and concise view of what is going on internally in the Stream pipeline between each intermediate operation and also shows the final result of the Stream. This will pull up the Stream debugger, as shown previously in the article. 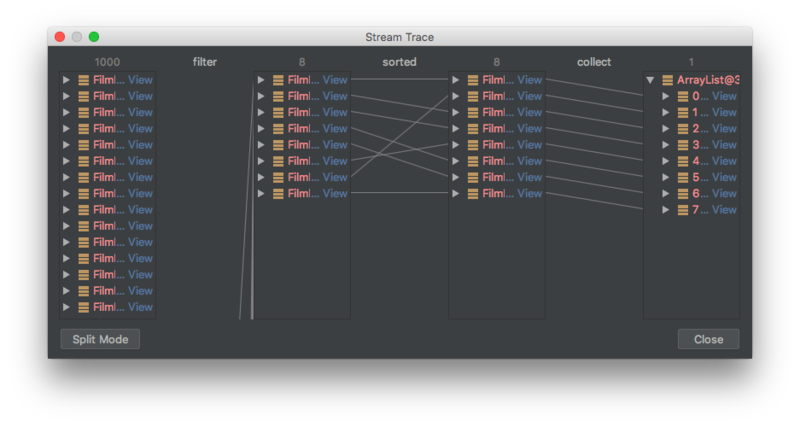 I will use the Stream ORM Speedment that allows databases to be queried using standard Java Streams, and thus, these streams can also be debugged with IntelliJ. A Speedment project can be set up using the Speedment initializer. This will filter out all Film objects with a length equal to 60 minutes, then sort those Film objects according to the Film.RATING (descending) and then collect these elements into a List. As can be seen, there are 1,000 films in the initial stream. After the filter operator, just eight films remain, which are subsequently sorted and then collected to a List. As can be seen, it is possible to interact with the Stream debugger and click on elements whereby their path in the Stream pipeline is highlighted. It is also possible to scroll among the elements for individual steps. Speedment normally optimizes away intermediary operations in a database Stream and merges these steps into the SQL query. However, when the Stream debugger is used, no such optimization takes place and we are able to see all steps in the stream pipeline. 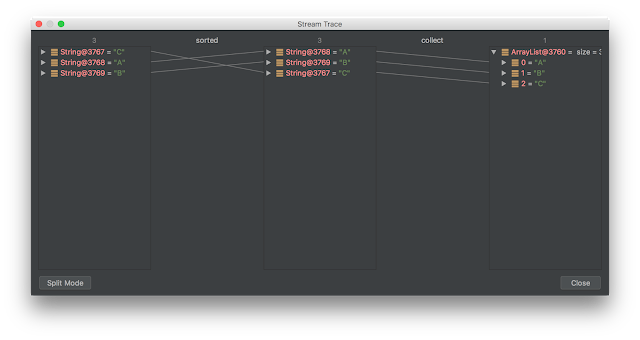 The Stream debugger is a hidden gem that can be of significant help when working with Streams. I think the IntelliJ team has come up with a really good feature here! You can download Speedment here and IntelliJ here.